July 2018 - The City of Ridgefield, Washington | Forward Thinking. Rooted in Tradition. Due to high temperatures and windy conditions, the City of Ridgefield is instituting a total recreational burning ban. All outdoor burning including recreational fires is prohibited within the city limits beginning July 26, 2018 at 12:01AM. This ban is based on weather conditions and community fire safety needs. It will remain in effect until weather and fire danger conditions improve. Recreational fires, campfires and fires in outdoor fireplaces or chimney-type devices are not allowed. Safe alternatives for outdoor cooking that are not banned include self-contained camp stoves, propane or charcoal barbecues. An update will be provided when the recreational ban is lifted. Happy Independence Day Ridgefield! We wish you all a fun, safe and patriotic Fourth of July. Remember that America celebrates Independence Day on the Fourth of July every year. We think of July 4, 1776, as a day that represents the Declaration of Independence and the birth of the United States of America as an independent nation. 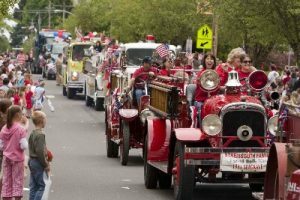 Thank you to the volunteers who have planned the celebration in Ridgefield with a fun run, grand parade celebrating 100 years since the end of WWI, and other hometown type activities throughout the holiday in downtown Ridgefield. We hope you will join the fun! If you are attending the parade, you can place chairs on the parade route no earlier than 6PM on July 3rd. Anything placed on a City sidewalk or other right-of-way prior to that time will be removed. Due to the fun run and parade, there will be street closures on Pioneer and Main during the morning hours. There will be lengthy traffic delays coming into downtown Ridgefield during the morning. Please listen to and respect the volunteers who will be directing traffic and helping with parking. And, obey all traffic and no parking signs. In observance of the holiday, City offices will be closed on July 4.